Adelanto GP Big 6 Race Report – After dominating the AMA Big 6 West Coast Grand Prix (WCGP) Series Pro II championship in 2015, Trevor Stewart knew the next step would be winning in the Pro class. He—and sponsors—felt it was only a matter of time, and that time finally came at the Adelanto GP Big 6 hosted by the So Cal Motorcycle Club, the opening round of the AMA District 37/FMF Big 6 Grand Prix Series. The Johnny Campbell Racing (JCR) Honda rider proved untouchable in the $2000, 90-minute WCGP feature race to kick off the season, leading from start to finish aboard his CRF450RX. 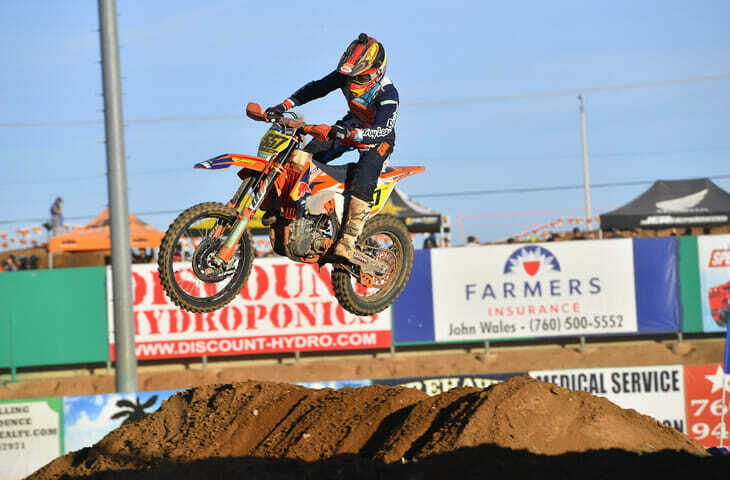 He finished 12 seconds ahead of Rockstar Energy Husqvarna Factory Racing Off-road Team’s Dalton Shirey while FMF/Maxxis/RPM Racing KTM’s Eric Yorba rounded out the podium, a further 13 seconds back. The expected showdown between East Coast and West Coast racers didn’t quite materialize on the super-fast course based at Adelanto Stadium. After getting too throttle-happy and spinning the rear wheel at the start, FMF KTM Factory Off-road Racing Team’s Kailub Russell—who owned the season finale last month in his first-ever Big 6 GP—discovered he has a little more fine-tuning before he’s at the front, and he settled for fifth place behind Chaparral Motorsports/Precision Concepts Kawasaki’s Justin Seeds. Of the race he said, “I got a holeshot and it’s not [usual] for me so when it happens, it’s something special, for sure, and I took advantage of it. I sprinted hard those first two laps and I tried to break away a little bit. It was a first for me because I’m never out front early—at least I haven’t been since I was on two-strokes. It was a nice feeling again and I knew what I had to do. 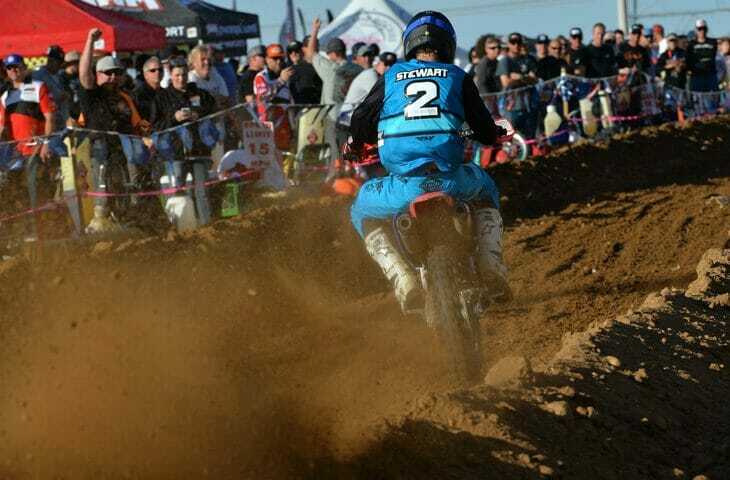 Rain earlier in the week left the fast course in nearly perfect condition, but despite being unable to kick up a cloud of dust to hide in, Stewart still inched away to eventually win with a 12-second gap over second. At first, it was Yorba who held that spot on his 450 XC-F, though after a couple laps Shirey put his FX 450 in the runner-up slot to stay. Though Yorba passed him when officials directed Shirey through the alternate instead of over the infamous water jump, Shirey repassed Yorba the next lap in nearly the same spot. He couldn’t erase Stewart’s lead, however, and settled for second, also while riding sick and unable to train or practice normally. Justin Seeds represented the new collaboration between Chaparral Motorsports and Precision Concepts well with fourth after an unplanned pit stop to rectify a handlebar issue on his KX450F put him back in 14th early. Zip-Ty Racing CRF450R-mounted Justin Wallis, defending series champ Zach Bell on his 3 Brothers Racing/STI Husqvarna, John Burr Cycles KX450F rider Ryan Reina, WCGP Pro II winner Clay Hengeveld and defending Pro II champ Beau Baron rounded out the top 10 overall. Mark Kariya | Contributor Kariya spends way too much time in the desert, but we’re glad he does as he’s the man who gets us our coverage of all things sandy.